250 gm. whole wheat chapatti flour. You can add 1/4th chickpea/besan flour to wheat flour or use multigrain flour. Place flour in a bowl and add enough water to make a soft dough. 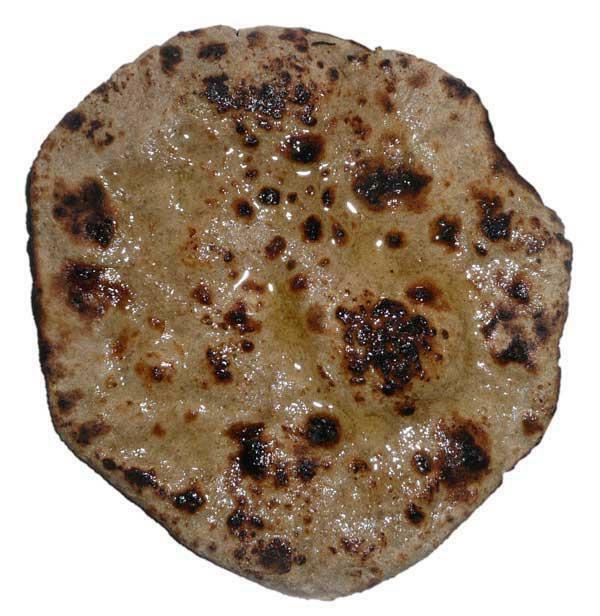 It is impossible to make this type of roti with firm dough. Knead well for 5-6 minutes. Leave to stand for 20-30 minutes or so and knead a little again to make it smooth. Break dough into 10-15 portions, depending on the size and thickness of chapatties you prefer. Heat a griddle or tava. Wet your palms in cold water and flatten the dough ball by slapping it between the palms. Wetting stops the dough from sticking to palms. You have to rotate the dough each time you slap it against the opposite palm, to ensure that it remains circular and is evenly flattened. Spread a layer of water on the side of the roti which will first go on to the griddle. This is essential to get that special taste of Pani ke haath ki roti. Put the roti on the tava/griddle. Turn it over when you can see a few blisters on the under surface. Turn over and cook the other side same way. Next step can be done either on a direct flame or in a grill. To cook on a flame, pick the roti with tongs, place directly on a medium flame, and move it around and back and forth continuously, turning it over, to cook everywhere evenly and crisply, on both sides. It should be cooked evenly all over and quite crisp. Serve immediately, coated with a thin layer of butter or ghee, with dals, saags or any curry of choice. Variations: You can add various saags like spinach, fenugreek/methi leaves, bathua/pigweed etc. to the roti dough. If you are unable to slap the roti around in your palms, you can make a fairy good imitation by rolling out the roti thickly and the brushing water on both sides, before cooking it on tava/griddle.